Summer is almost here, which means it’s that age-old time when kids flood the library in search of books to read or have read to them. Books for outside picnics, books for vacations, books for summer day dreams, and books for hot starry nights with a side of ice cream. 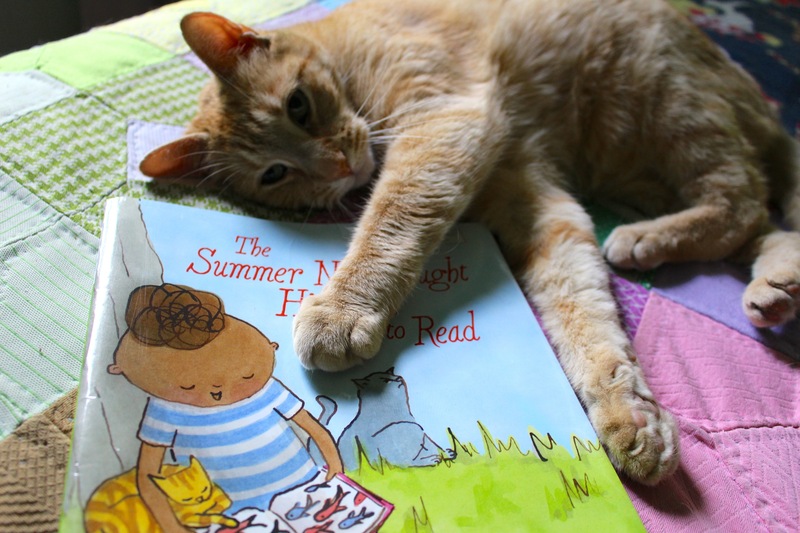 The Summer Nick Taught His Cats to Read by Curtis Manley, illustrated by Kate Berube (public library), is the perfect celebration of this time when both reading and one’s imagination are unrestricted with the ease of longer days and more free time. 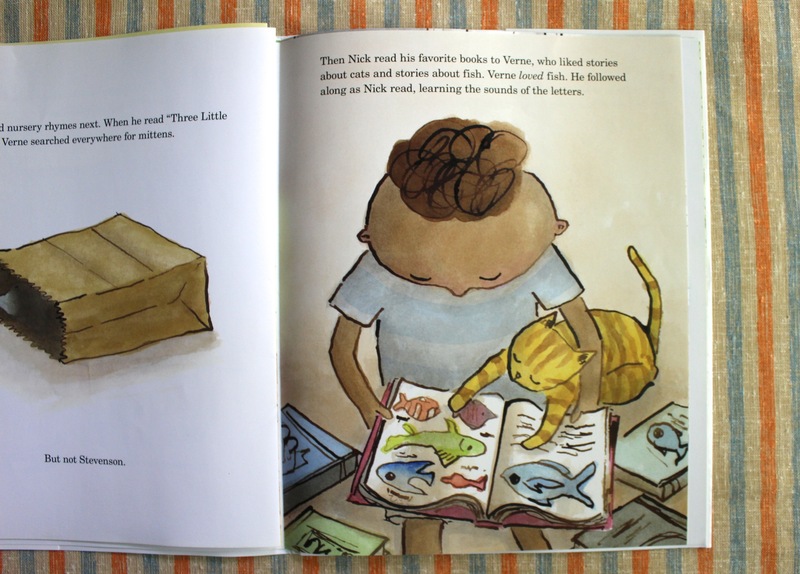 For some kids, an interest in reading doesn’t come easily or quickly and that happens to be the case with Nick’s two cats, Verne and Stevenson. In the summer, Nick, Verne, and Stevenson do everything together. 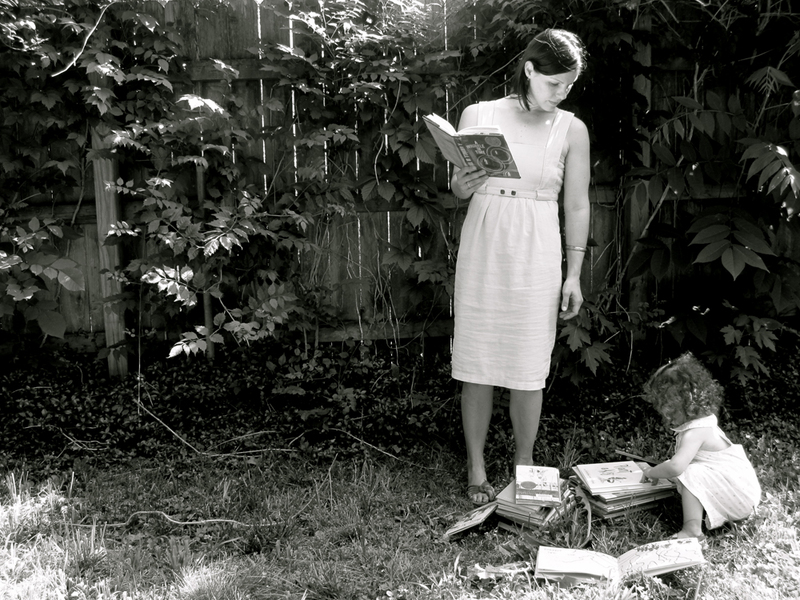 Well, they do everything together except one thing– Reading. 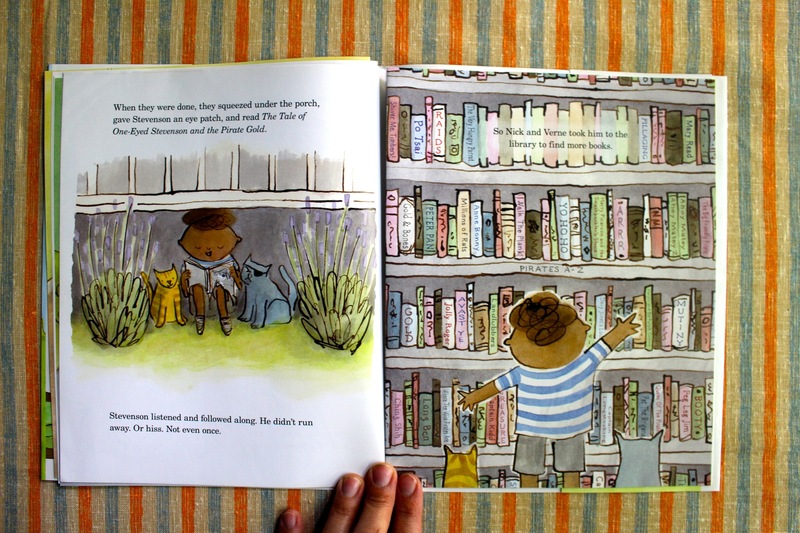 The cats couldn’t be more indifferent to books, so one summer Nick decides he will teach Verne and Stevenson to read. Nick’s first attempts fail, but slowly Verne becomes more and more intrigued, and with practice and Nick’s encouragement he’s able to read stories on his own. Stevenson on the other hand continues to be grouchy and actively disinterested whenever books or talk of reading enters the picture. That is, until the day Nick finds something of Stevenson’s that he uses to help foster an interest in reading. Everyone (even cats) learn to read in their own way and in their own time. Sometimes it just takes one special book to get a beginning reader hooked on reading for life. 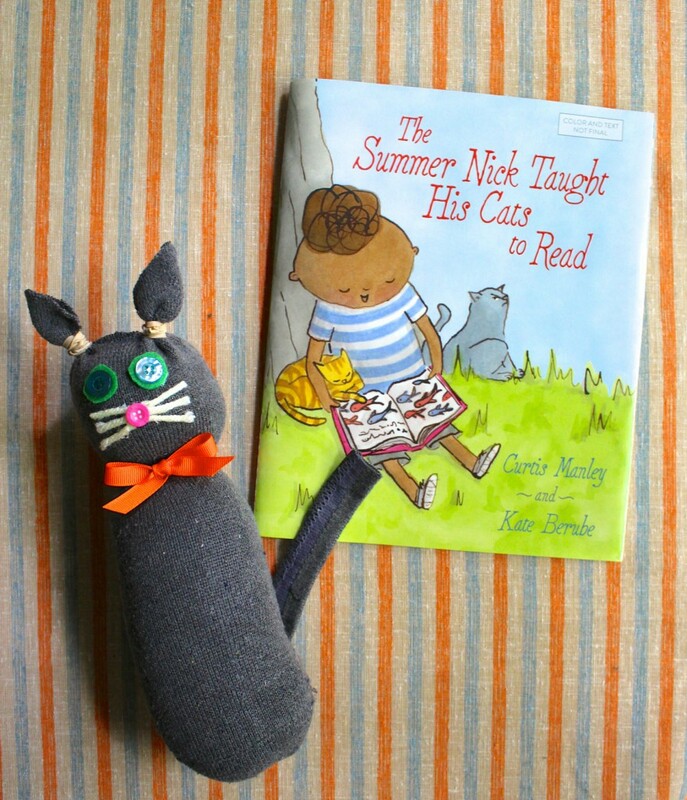 Readers can be just like Nick (who loves reading with his cats) by making this easy DIY cat stuffed animal via a repurposed sock that transforms into a cuddly reading companion in no time! 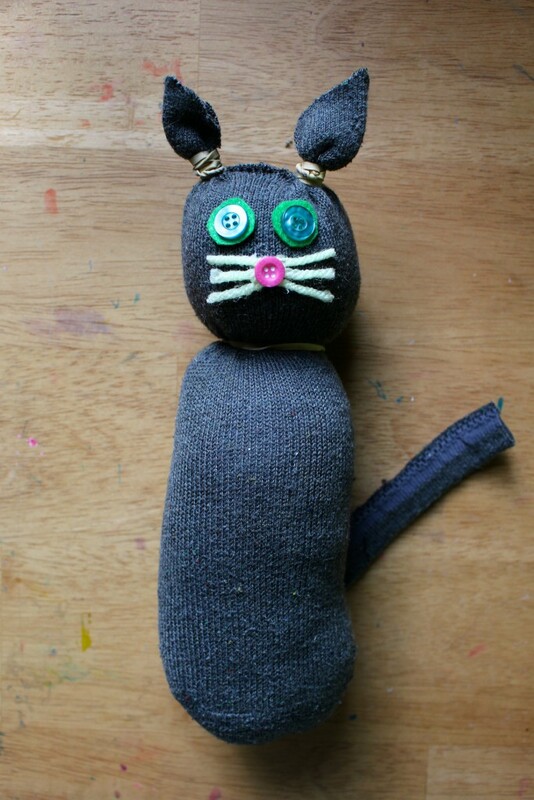 The sock you use can be any old sock. The one I used had been missing its mate for awhile and may have a tiny hole in the heel. Also, don’t be restricted to the materials I listed for decorating your kitty’s face. 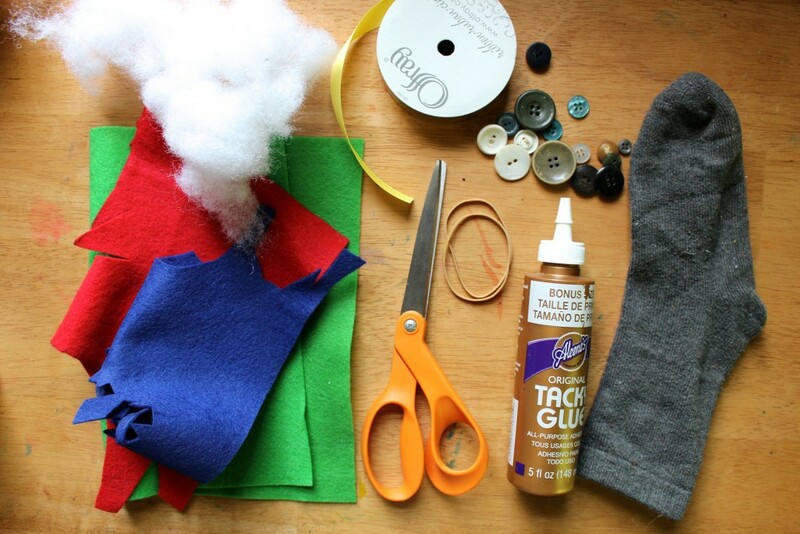 Sequins, fabric, beads, and anything you happen to find that might work are also fair game. Start by filling your sock with poly-fil. 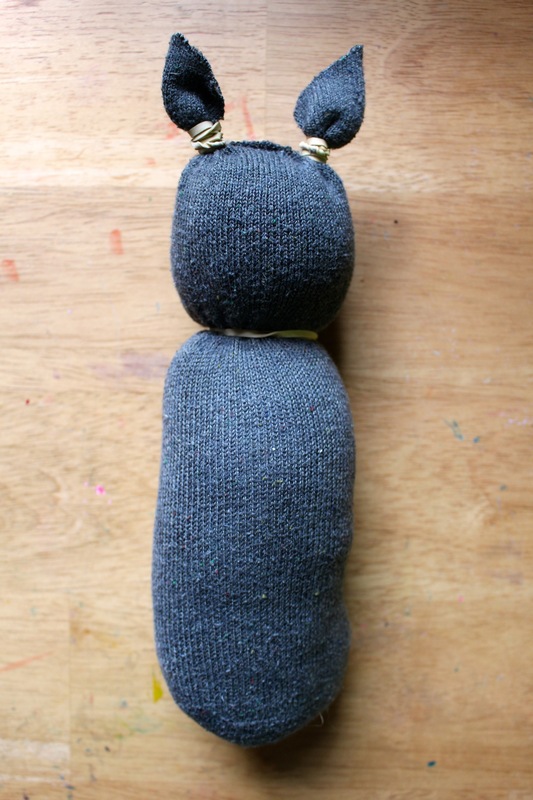 Stuff it to a huggable size and leave an inch of room at the opening of the sock. 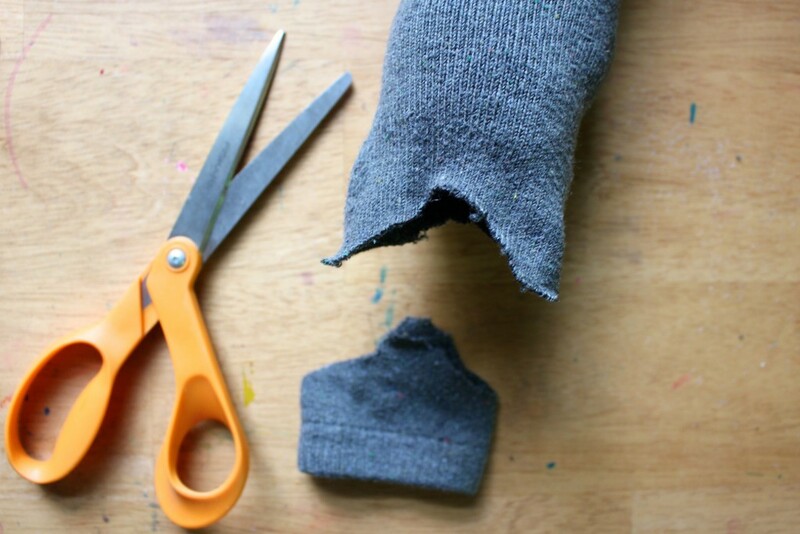 Cut off the opening of the sock in a “V” shape. These will be the ears of your cat! 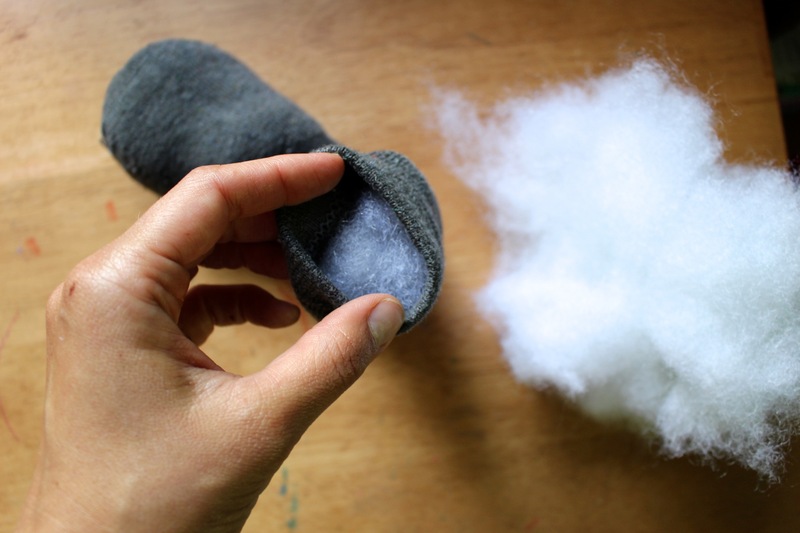 Flip your sock over so the toe of the sock is facing down and the opening is facing up. Wrap a rubber band around the two points you just cut out of the sock’s opening. Kitty ears! 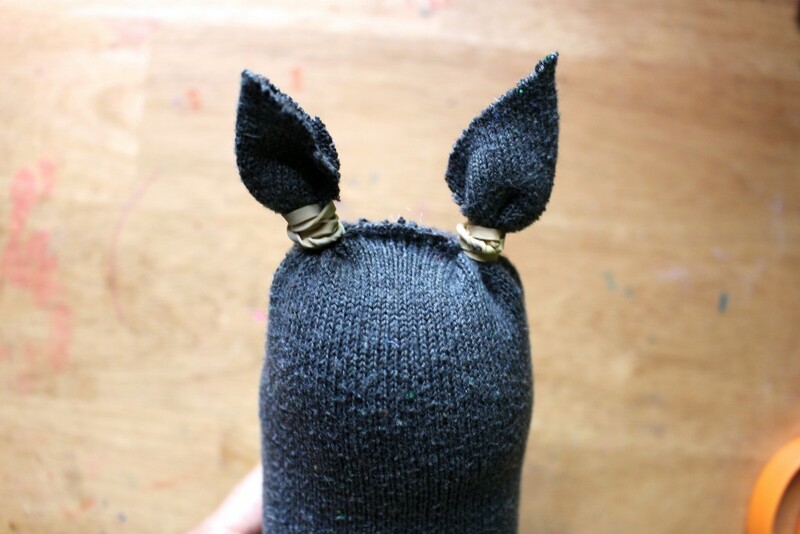 If there is still a little opening between the ears, glue those ends together with fabric glue. 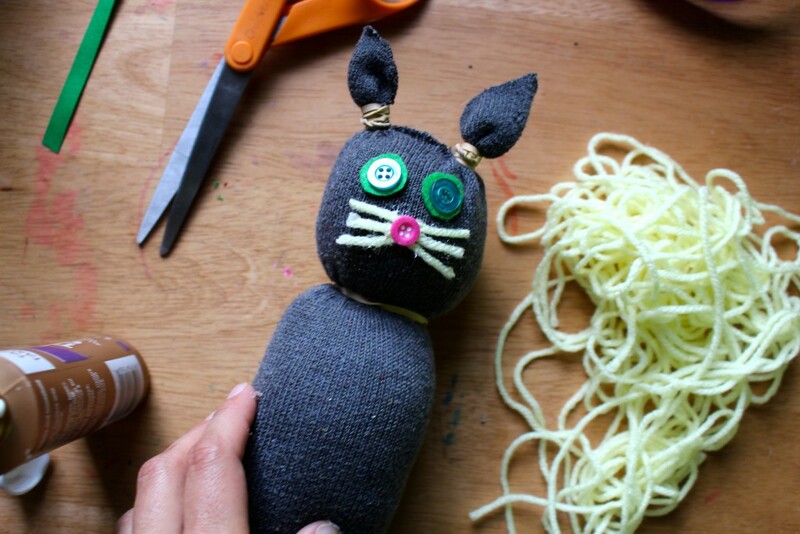 Using another rubber band, create a head by wrapping it around an inch or two below the ears. It’s starting to look like a cat! Next, use whatever materials you’d like to make the face of your cat. 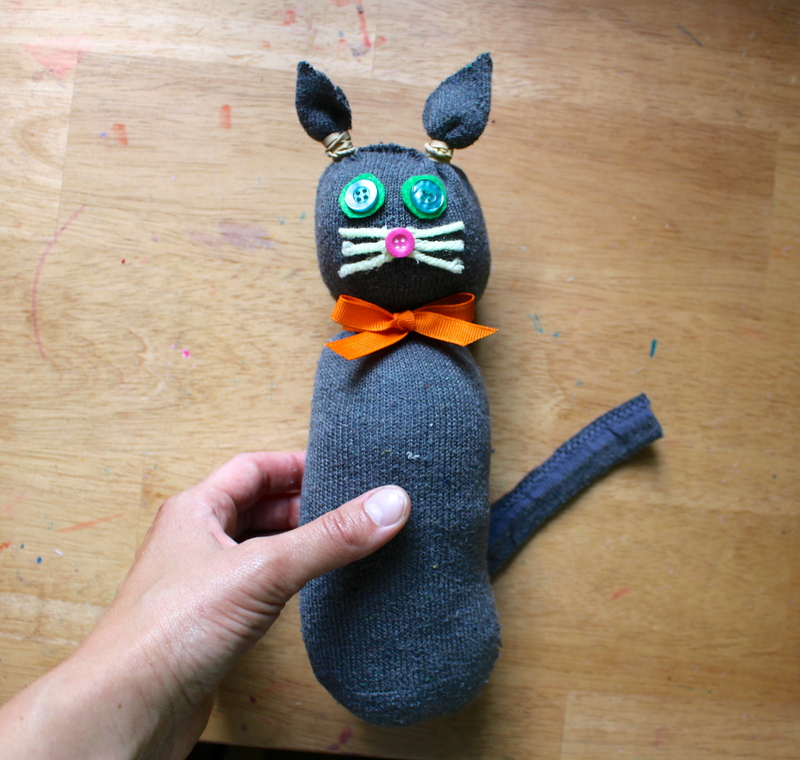 I used yarn, felt, and buttons and glued them all on with fabric glue. 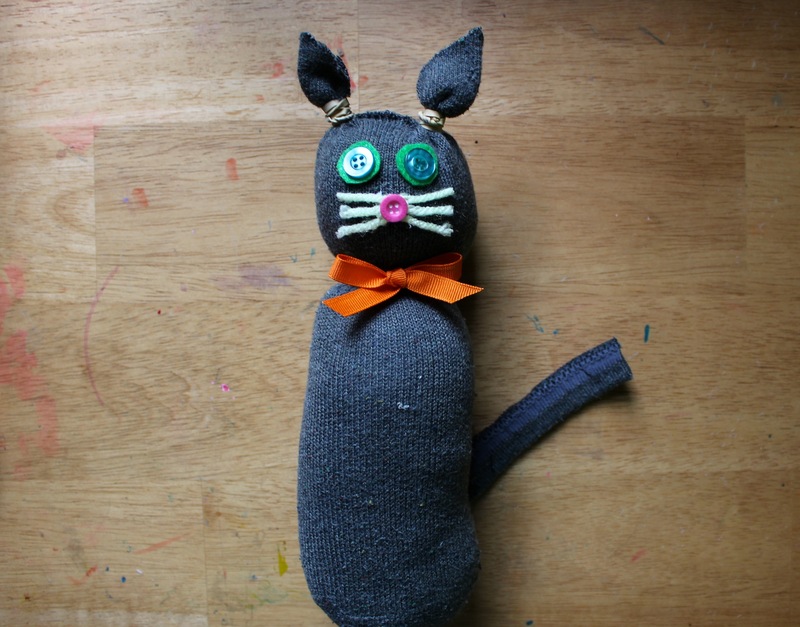 We decided this cat was quite dapper and added an orange bow tie around his neck for the finishing touch. 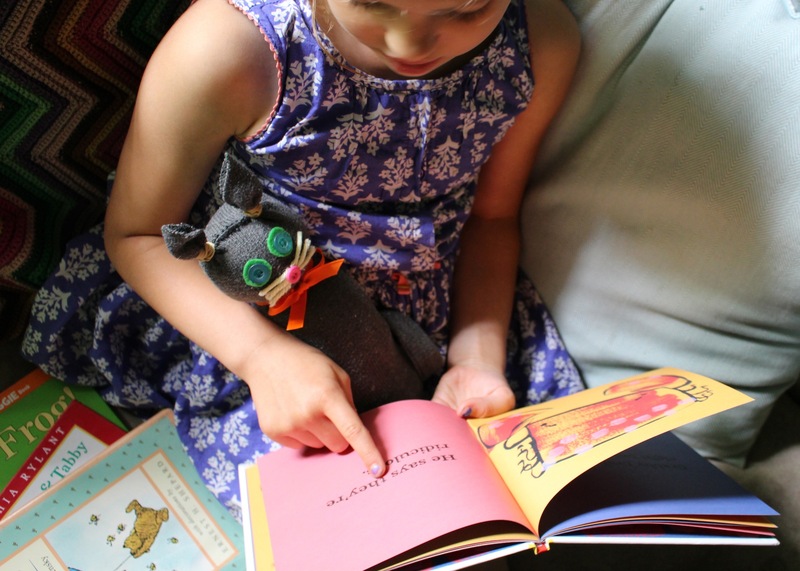 Now you’re cuddly stuffed animal kitty is ready for all the reading adventures to be had! 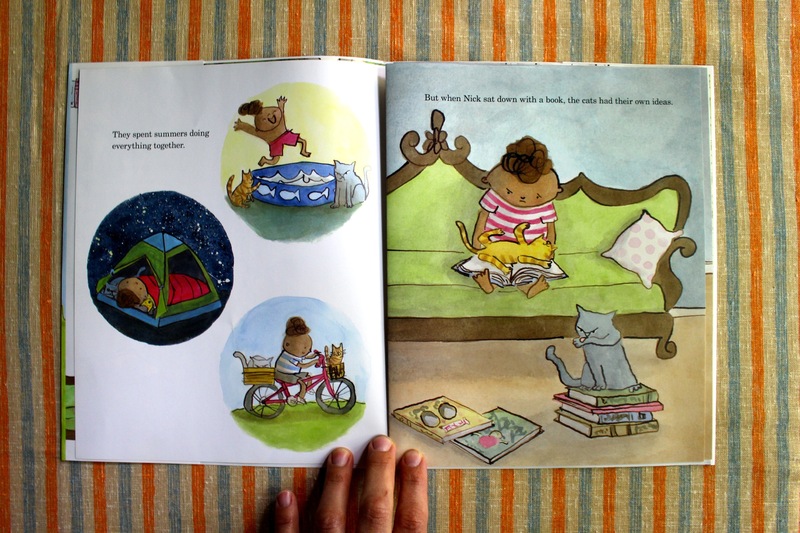 Not only will your child have a friend to read with, but the act of reading aloud to animals, stuffed or living, helps build reading skills and beginning readers gain confidence by creating a non-judgmental, nurturing environment (see here and here). And if you happen to have a lovable furball at home, I’m sure they won’t be opposed to a story or two from time to time as well. Especially, if there’s petting and snuggles involved. I love, love, love your blog! You are such an inspiration. So natural, so simple, yet So. Spot. On! Thank you. Thank you for these kind words, Rhonda. They mean so much to me. I really try hard to put content out there that I feel readers will enjoy and is fun and accessible. You made my day! Thanks for reading!